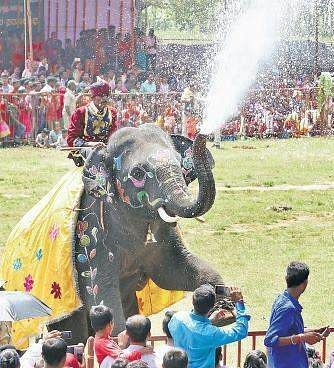 Thousands of people congregated at the camp situated on the banks of the Tunga river to be part of the elephant festival. 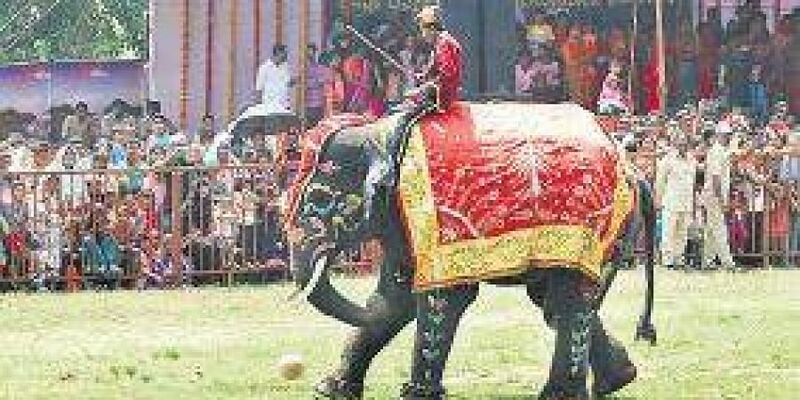 SHIVAMOGGA: An elephant festival organised by the Forest Department at the Sakrebailu Elephant Camp attracted audiences, especially children in large numbers, who were treated to different skills of the pachyderms. They played football, cricket and also ran a race. Thousands of people congregated at the camp situated on the banks of the Tunga river to be part of the elephant festival. The festival was organised on the 64th valedictory function of the Wildlife Week. On the occasion, winners of various competition were given prizes and certificates. A wildlife team, including mahouts and kavadis of Sakrebailu Elephant Camp showcased different activities of the elephants much to the joy of children. Eleven elephants, including three calves, also enjoyed sugarcane and banana eating competitions they participated in. When Sharade, the youngest elephant of the camp, refused to go to school, in a play they enacted, her siblings Hemavathi and Shivu forced her, by pulling her ears. The children could not have enough of the 11 neatly dressed and decorated elephants, obeying all orders of the mahouts and kavadis.